Singing Express 4 is the fourth title in a complete Singing Scheme for the primary school. Cross-curricular topic-related songs, specially written and collected, support the child's developing voice through the primary years. Inspired by the Government's Singup initiative Singing Express effectively comes with its own singing leaders and puts them directly into the classroom to teach children and teachers alike. Each book and DVD-ROM pack provides songs, chants, rhymes, stories and warm ups. Easy to access, easy to learn and share with children. The materials are designed for whiteboard display and include backing tracks, lyrics, song movies and specialist singing help whenever needed. If you're a teacher who has lost your confidence teaching children to sing, this book and DVD gives you all the resources you need to lead singing and sing-learning in the classroom. 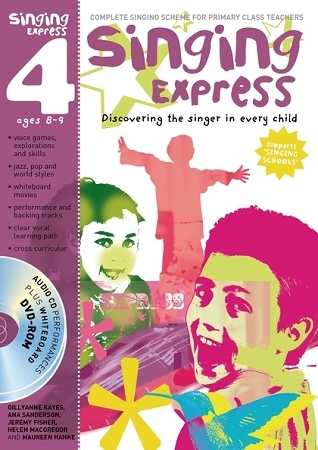 Singing Express 4 is the fourth in a series of four packs and is for ages 8-9 years. "A wonderful package to help develop singing skills in Primary education, this is a complete scheme with book, whiteboard DVD-ROM and audio CD"